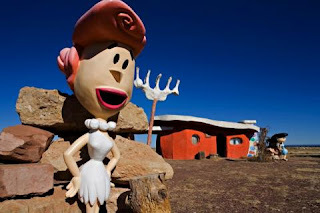 "Flintstones" fans with a few million dollars now have a chance to rule over the town of Bedrock and own a page right out of history. The owner of Flintstones Bedrock City, a northern Arizona theme park designed around the Hanna-Barbera cartoon, said Friday she is selling the property for $2 million. Linda Speckels said she is ready to retire from operating the park and campground in Williams, about 30 miles south of the Grand Canyon.